Every year car makers come up with new technologies that are intended to help prevent potential accident and increase driver safety. These range from technologies designed to make the driver aware of hazards, blind spots and the conditions on the road to prevent an accident. One of the oldest safety measures added to a vehicle that continues to serve its purpose is the safety belt that is included for every passenger that a vehicle is meant to hold. Research has shown that wearing a seatbelt can reduce the risk of death or injury in an accident by 50%. Car accidents are the lead cause of death of people between the ages of 5 to 34. Each year millions of people are in emergency rooms across the United States on account of car accidents. Seatbelts can make the difference between saving a life and preventing devastating injuries. Even with all the statistics of seatbelts and how they save lives, people still often refuse to follow the simple principle of buckling up when riding in a vehicle. The “Click it or Ticket” campaign is a program intended to inform people about the necessity of putting on the seatbelt while operating or riding in a vehicle and how it is extremely beneficial to both their wellbeing and that of the other passengers in their vehicle. There are many misconceptions when it comes to seatbelts and how useful they really are in preserving both one’s life and keeping one in a safer position in general. Many think that seatbelts are not necessary as long as the car is equipped with airbags. Unfortunately, this is simply not true as airbags are designed to work in conjunction with a seatbelt and if the seatbelt is not being used a deployed airbag can actually do more harm than good. Many drivers believe that the size of the vehicle and whether a person is driving a SUV or pickup truck has a factor in how safe the occupants are. The truth is that passengers in those types of vehicles will have a 60 percent chance of being safer if they chose to wear their seatbelts. Some of the major misconceptions about seatbelts are that they can trap you in a fire or underwater if an accident were to take place in that type of situation. The reality is that seatbelts help keep passengers conscious and alert when a crash takes place and help drivers react to potential disasters in those situations. A majority of states across the U.S. have passed laws that will give strict fines to those found to be without their seatbelts. A majority of these states have written laws that prohibit the front seat occupants from not wearing seatbelts but many states have also begun to enforce seatbelts for all occupants of the vehicle. New York’s Vehicle and Traffic Law section 1229 covers the different types of fines and penalties imposed for seatbelt violations. A $50 civil fine is imposed against drivers that do not wear their seatbelt along with a $93 surcharge. Special attention has been given to child passenger laws, which require restraints on child car seats, and booster seats to ensure that younger children who cannot properly fit into a seatbelt intended to fit an adult will still be safe in the vehicle. Drivers with child passengers that are found not wearing a seatbelt can be charged a $100 fine with an $85 surcharge, along with 3 points against the driver’s license. 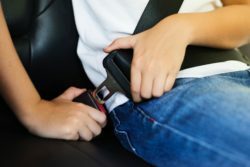 Although laws in many states may not require that adults in the rear seat must wear seatbelts this does not mean that these passengers are not at a potential risk. Seatbelts must be worn by all in the vehicle to ensure safety and security for all the passengers.